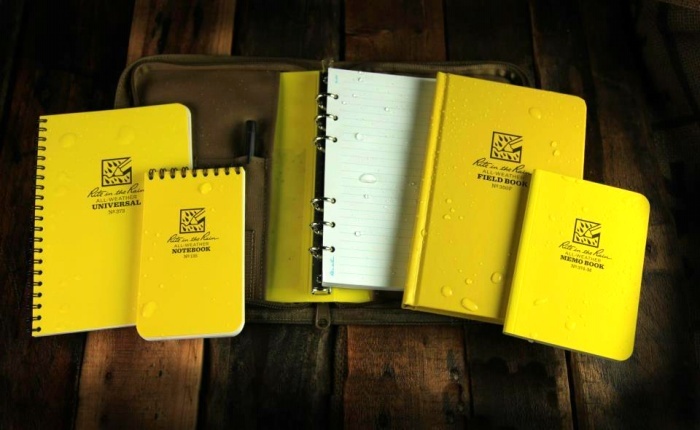 Rite In the Rain Notebooks Stay Dry, Even When It's Raining Cats and Dogs | OhGizmo! Got clammy hands? Take a lot of notes outdoors? Then these Rite as Rain notebooks are the ones that you need. They’re water-proof, which means that it’s resistant to rain and humidity. In a way, it’s also klutz-proof–especially against people who spill drinks or foods on their stuff a lot. Aside from plain old water, these notebooks are sweat-proof too, so you don’t have to worry about anything blotting when you rest your sweaty palms on the paper. The earliest version of the Rite as Rain notebook was developed by Jerry Darling back in the 1920s. It’s evolved over the years and they’re now available in a variety of bindings, sizes, and sheet types.